When selecting a bed for your dog, make sure it has enough cushion and support to keep your best friend happy and healthy. There are many types of dog beds on the market. They range from oversized pillows to elaborate sofas and chairs. The padding in the bed is what gives it the most comfort. Egg crate foam is a common kind of therapeutic foam padding which helps evenly distribute a dog’s weight across the bed. If you are wondering what is the best bed for an older dog or even a new puppy, there are some things you should know about egg crate foam. What is Egg Crate Foam? Egg crate foam gets its name from its wavy appearance which resembles the bottom of an egg carton. The foam is cut in a way to form peaks and valleys across the surface. This bumpy surface is softer than a solid block of foam and helps air circulate. The surface also offers some shock absorption which is good for older dogs with arthritic joints. This same foam is often found in mattress toppers for human beds and helps make an uncomfortable mattress softer and cooler. Egg crate foam is considered a type of therapeutic foam. 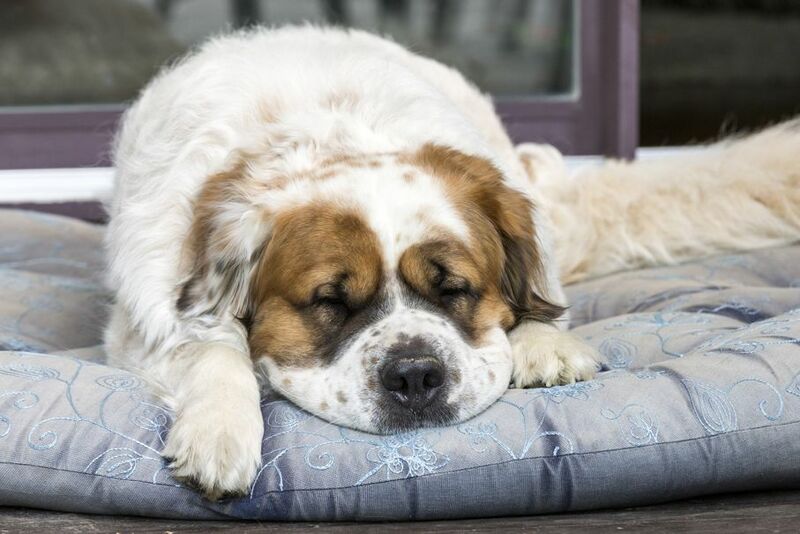 Older dogs may start to find their stuffed beds lumpy and uncomfortable. A therapeutic dog bed offers better support for the body and helps alleviate pressure on joints and bony areas. 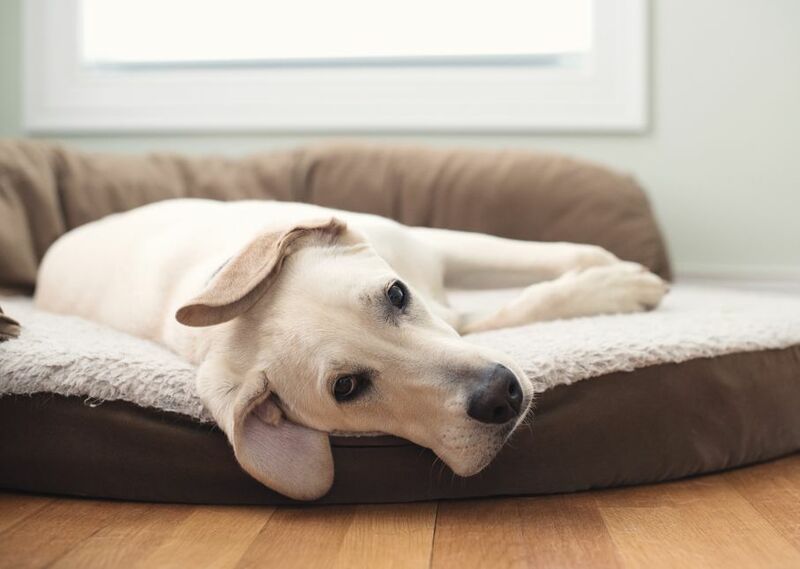 If your dog is constantly getting up from his bed and can’t seem to get comfortable, it may be time for a therapeutic bed. 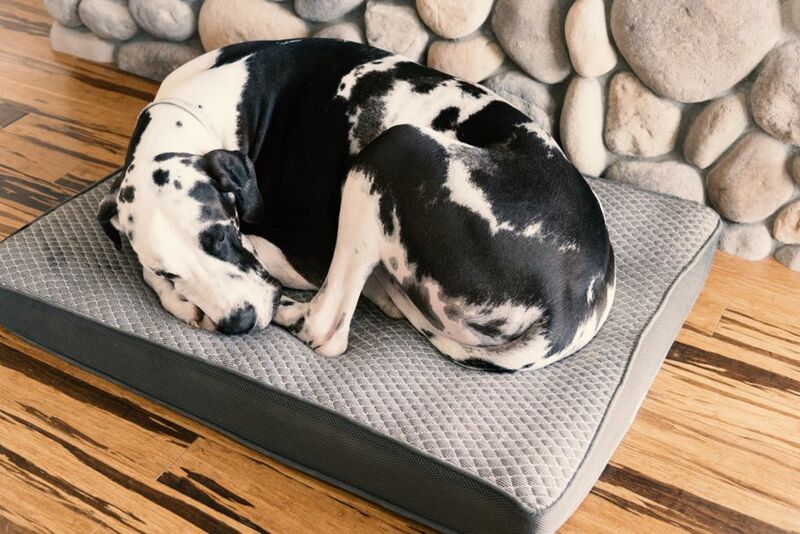 There are different types of therapeutic beds, but egg crate foam is one the least expensive and will adequately support an average dog and keep him cool in the hotter months. In colder conditions, extra blankets can be used. 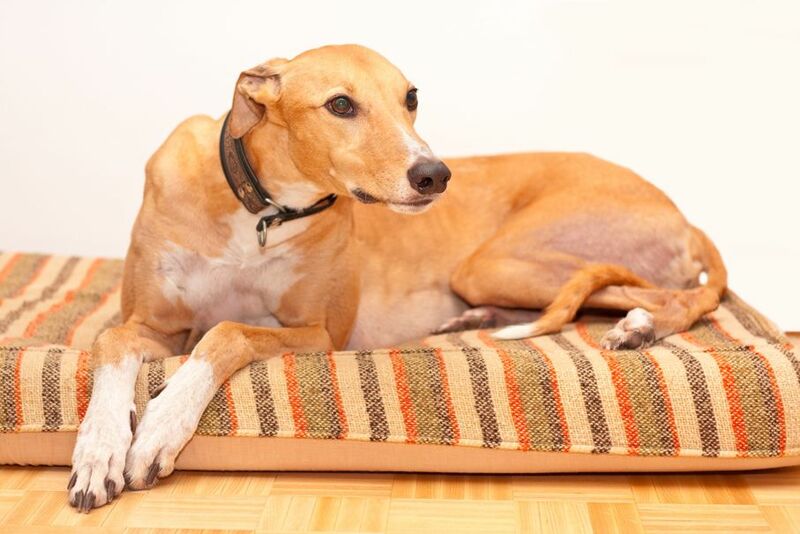 An orthopedic egg crate foam bed is also good for thin breeds such as greyhounds and whippets which are naturally skinny and have prominent bones. The design of the egg crate foam cushions pressure points and allows the dog to rest comfortably. Any dog with a painful health condition will appreciate the softness of a therapeutic foam bed. Egg crate foam beds tend to be mattress shaped and low to the ground which makes them easy for older dogs to get in and out of. They are also a good choice for dogs who like to spread out when they sleep. Working dogs and young active dogs will also appreciate the comfort of egg crate foam compared to a regular dog bed or a hard floor. Unlike memory foam and synthetic padding which slowly settles under the weight of a dog, egg crate foam reacts immediately. This is a good feature for most dogs, but over time, the foam will break down. If you start to see a permanent imprint of your dog in the bed, it is time to buy a new one or a new dog bed replacement foam insert. For large, heavy dogs, memory foam may be a better option. Egg crate foam is not a good choice for dogs who like to chew their bed or other soft items. The foam is very soft and will not hold up to sharp teeth. Older dogs tend to sprawl out more when they sleep or nap. You will want a bed large enough to accommodate the full length of your best friend. Measure your dog while he is sleeping and then select a bed that will make him the most comfortable. Go at least a foot beyond your dog’s dimensions. When shopping online, ignore breed and weight recommendations. A bed for a “large” dog may not be large enough for your dog. Egg crate foam comes in different thicknesses and densities. Depending on the weight of your dog, you will want foam that is thick enough to support his weight with minimal sinkage. The height measurement of the foam is to the top of the high ridges. The ridges will crush down when your dog lays on it so a foam height of three inches may only keep your dog two inches off the floor. As a test, push down on the bed with your hand. If you can feel the floor, the bed won’t offer much support for your dog. Avoid cheap beds as they are probably made with inferior foam. Always read online reviews before buying an egg crate foam bed online. Look for a dog bed that has a removable and washable cover. It is much easier to wash a cover than an entire bed. Egg crate foam can be spot-washed to remove any stains. Lightly spraying the foam with a mixture of water and vinegar will help remove any doggy odor. Just like people beds, dog beds can be expensive. Making an egg crate bed is a simple DIY foam dog bed project that can save you a lot of money, especially if you have a large dog. The egg crate foam used in dog beds is no different than the foam used in people mattress toppers. Look for a good deal on a three inch or greater mattress topper and cut it to size. Cover the foam with a soft blanket and you now have a comfortable, therapeutic dog bed for your aging friend. If you are looking for a cheap extra large dog bed, this is probably the best alternative. If your dog tends to be a bit incontinent when he or she sleeps, absorbent puppy training pads can be placed under the blanket to protect the foam and make a waterproof dog bed liner. A box of 50 pads is relatively inexpensive and blankets are easily washed. Any “accidents” from older dogs should be cleaned up quickly to discourage your pet from using his bed or living room carpets for a potty break. Don’t throw away an old lumpy bed if the main insert is replaceable. Egg crate foam can be cut to any size or shape to make a dog bed insert replacement. A bed provides a dog with a sense of security. Choose an out of the way spot for the bed, but close enough to people so the dog feels like part of the family. A dog’s bed should be comfortable and a place that they can claim as their own. Make sure your dog has the best bed for his age, health, and size.